Limited Supply ProblemsOther ProblemsThe Nonsense of "Threshold"
Voyager used to be the only Federation ship in the Delta Quadrant. This original premise was maintained through seven years. Alas, the authors were not consequential in taking into account the resulting limitations. New shuttles kept popping up as if the next starbase were only a few light years away, not to mention that the ship, despite all the power outages and the frequent skirmishes, was always in perfect shape (the real-world reason being that this allowed to use stock footage any time). The development of the crew complement is investigated on a separate page. It may be due to a lack of better ideas that Voyager writers frequently had shuttles get into electromagnetic turbulences and crash on planets. Such a crash is no problem for starships that can simply be resupplied in a nearby starbase, but it is for Voyager. The official Star Trek Voyager Technical Guide V1.0, intended as guidelines for writers (sub-title: "Yes, but which button do I push to fire the phasers? "), ironically says that "Voyager normally carries two[!] 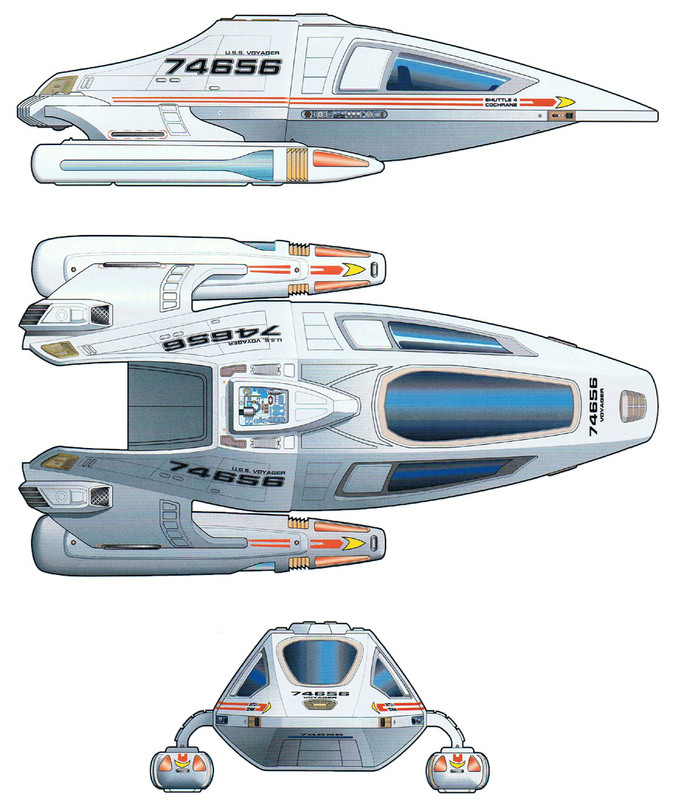 standard shuttlecraft, four of the smaller shuttlepods, and four EVA workpods". We have never seen any shuttlepods or workpods. 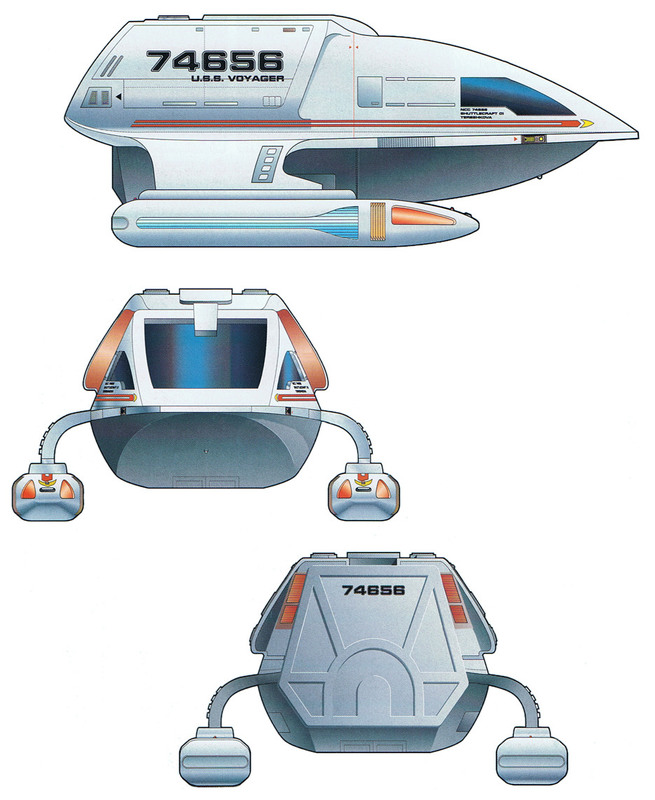 The two lonely shuttlecraft were obviously both supposed to be of Type 6, since this one is depicted in the booklet. In any case a complement of two shuttlecraft was extremely short-sighted. Destruction of Type-9 shuttle in "Day of Honor"
Note that apparently minor damages with a few sparks and a bit of a fire inside the cabin are not included. It is evident that such a shuttle consumption is only possible if spare parts for repairing and assembling shuttles are available. We could imagine that most of the components of a shuttle are relatively simple, and can therefore be replicated. Still, very complex parts like the computer system, which employs quantum level computation, and the warp core would have to be stored. If the crew can build the highly advanced Delta Flyer from scratch, building new standard shuttles from existing plans and materials shouldn't be such a great problem anyway. 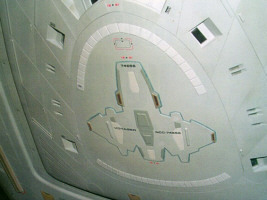 How many shuttles did Voyager really have at the beginning and how many were built afterwards? 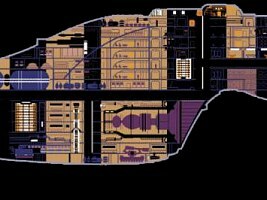 The aft section of an Intrepid-class vessel does not seem to be large enough to hold more than eight Starfleet shuttlecraft, and Neelix's ship which seems to be somewhat larger has to be stored as well. Fitting the Delta Flyer into the shuttlebay is still another problem (see also below). In an optimistic estimation, we can assume that there were eight shuttles aboard when Voyager left for the Badlands. 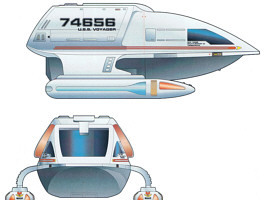 Since Voyager's complement consists of as many as three different shuttlecraft types, it is a good guess is that there were two shuttles of Type 6, three of Type 8 and three of Type 9. This means that at least seven new shuttles of different types must have been built from stored spare parts. Given Chakotay's incredibly funny statement of a "full complement of shuttles" in "Alice", all fifteen until then destroyed shuttles should have been replaced, unless he counts the Delta Flyer as an equivalent of four or more shuttles. The original complement must have been 40, two of which have been used to destroy the Caretaker Array, armed with tricobalt warheads. This leaves the 38 torpedoes that Tuvok counts in "The Cloud". He states that they can't be replaced. Nevertheless, the number of torpedoes used in the following exceeds 38 by far, even if we take into account only those which were seen or explicitly mentioned as being fired. The resulting lower limit is 93 torpedoes. The only explanation is that the crew has found a way to replicate more torpedoes. Considering that a torpedo should be much less complex than a shuttle or even the Delta Flyer, this is only plausible. The only problem is Tuvok's premature pessimism. During the first two seasons Voyager suffers from a permanent shortage of energy, which requires to ration replicator meals and obviously serves to justify the necessity of Neelix's kitchen. However, the holodeck seems to be in use the whole time, although this amusement arguably consumes much more energy than a small replicated meal, irrespective of the fact that most of the holomatter is usually recycled to energy. Moreover, the outside views show that almost all windows of Voyager are lighted, whereas most of the windows of the Enterprise-D were dark. Furthermore, all 15 decks have full life support. If I were a crew member, I would rather forgo additional luxury than my favorite food. The replicator rations are not mentioned any more in the third and forth seasons, while the crew are still enduring (or meanwhile enjoying) Neelix's cooking. 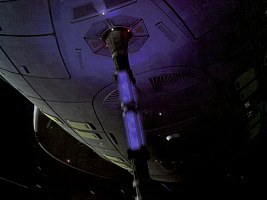 The usual explanation for the permanent operation of the holodecks is that they have an independent power source, as it was established in a few episodes and explicitly shown in "Night" were the hologrid was "frozen" when the computer failed. Seven says: "Independent subsystems are operational: environmental controls, holodecks." Anyway, what else should the allegedly independent holodeck power source be than a fusion or even a matter/antimatter reactor? What could be so special about them that they wouldn't be able to supply other systems too? Is there nothing like a simple "transformer" that could convert the plasma energy levels (i.e. the voltages) if they are different on the holodeck? Even if they are incompatible, the basic fuel (anti-) deuterium would be the same for all systems on the ship. So here is no reason to believe that if all other energy is gone, the holodeck can't serve as a spare power source. Much less is there a reason that fuel would be available for the holodecks, but not for the replicators. 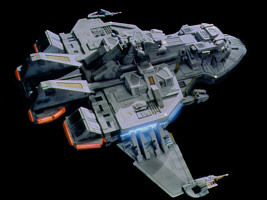 The construction of the Delta Flyer within a few days, as seen in "Extreme Risk", is a similar miracle as the transwarp shuttle in "Threshold" (see below). Moreover, I wonder why it has taken four years until Janeway realizes that a larger auxiliary craft could serve Voyager much better than the small, slow and fragile standard shuttles that are frequently shot down or lost in magnetic storms. So if they could build the Delta Flyer in no time, why didn't they do it much earlier? Another problem is how the Delta Flyer is supposed to fit into the shuttlebay. Read about the Size of the Delta Flyer. 1. The aeroshuttle was badly damaged at the very beginning of the show. I think this statement is hard to maintain, since everything was always repairable on Voyager, and building the completely new Delta Flyer seems more difficult. Even if the aeroshuttle were actually damaged beyond repair, it should have been mentioned at least at the time when it happened and several more times, something like "too bad we don't have the aeroshuttle". 2. They actually didn't need the aeroshuttle, or they wanted to preserve it. I don't think there is any reason to believe that, since Janeway didn't do anything to avoid dangerous situations in six years, so why should she be concerned about this auxiliary vessel? It is especially valuable? If so, why didn't they use this supershuttle at least for safe missions, or is it merely for decorational purposes? I think we may safely discard this idea. 3. The aeroshuttle actually doesn't exist. The shape on the bottom of the saucer is something else that accidentally resembles something like an independent shuttle or captain's yacht. This is actually the best excuse for not using or only mentioning the aeroshuttle. On the other hand, the Enterprise-D captain's yacht was not mentioned in seven years of TNG either although it definitely exists. Yet, the latter was only an unarmed oversized sublight shuttle supposed to ferry important diplomats. 4. 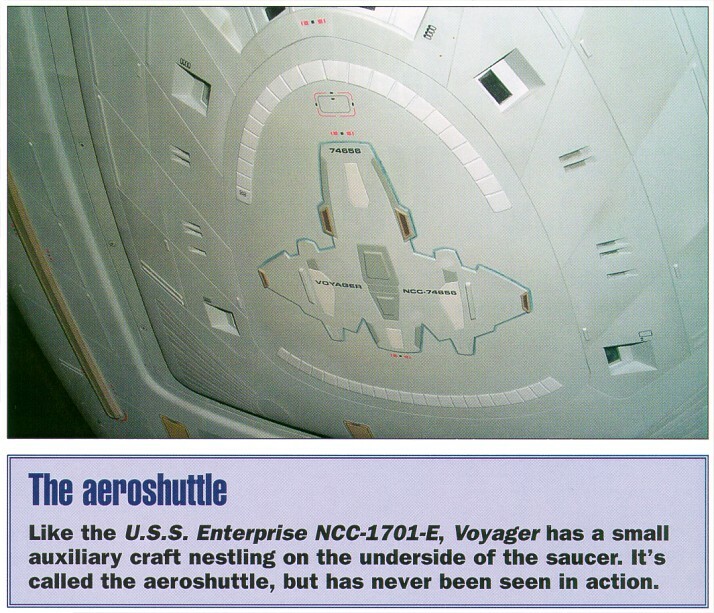 The aeroshuttle does exist, but it wasn't aboard when Voyager left for the Badlands. The structure on the saucer underside is a hatch or some sort of cover that will be removed once the aeroshuttle will be installed. But why would this cover have something that definitely looks like maneuvering thrusters? Now that the aeroshuttle hasn't been resurrected even in season 7 (although there were plans), we can either say that it never existed, or it was just not installed when Voyager went on the short trip to the Badlands. Since we can't simply deny the shuttle-like structure on the saucer bottom, I like the suggestion that there was just a placeholder for the aeroshuttle or that the aeroshuttle was not yet finished at the time of "Caretaker". Release of escape pods in "Workforce II"
In VOY: "Workforce" the crew leaves the ship using the escape pods and are captured and turned into workers, save Kim, Chakotay, the Doctor, and eventually Torres is returned. During an attempt to save the rest of the crew, Kim asks Torres: "How many escape pods do we have left?" She replies "5", and Kim says "eject 3 of them." The pods are captured by alien vessels, leaving Voyager with just 2 of originally 36 pods. The crew is rescued via transporters and it is safe to say the escape pods are not recovered. Considering that the crew assembled spare photon torpedoes and shuttles all the time and constructed two Delta Flyers, building 34 new escape pods does not seem to be a big deal. Still it is a stretch. Well, unless the pods are actually never replaced. We can't tell whether there are pods underneath the hatches or not. 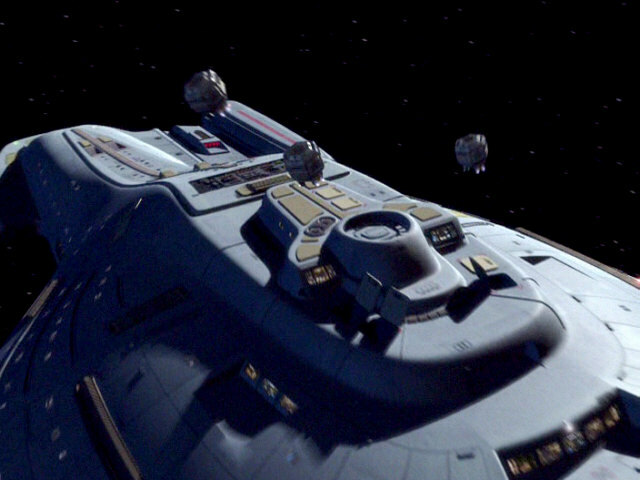 The most important specifications of Chakotay's Maquis ship are uncertain, including its class, size and even its name. When Chakotay, Torres or other Maquis crew members talk about their time on this ship, they should at least call it by its name. The name "Zola" stated in the Fact Files was never mentioned on screen. The latest information on the class name comes from Star Trek: The Magazine. An article tells us of a desktop model of Chakotay's Maquis ship, as well as several displays of the ship where it is a Ju'day-class ship named "Val Jean". This can also be seen on a screen in "Repression" and is therefore canon. On websites the Maquis ship is sometimes classified as Peregrine courier. However, the Peregrine courier or fighter is more likely a considerably smaller vessel shown e.g. in DS9: "The Maquis" and also employed to distract the Cardassian fleet in DS9: "Sacrifice of Angels". Chakotay's ship (here named "Liberty") is classified as Antares class in the novel Pathways. There is a lot of confusion about this class name, which the authors are obviously too fond of. In any case this is only one of several theories. 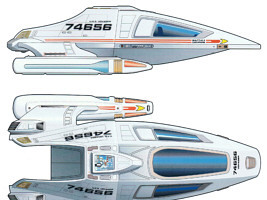 A diagram of the ship is depicted in the Star Trek Fact Files. The windows in the bridge section cannot be used as a reference, since they were not visible in "The Caretaker". The size of the bridge set, which seems to be only 5m wide, points to a very small ship of only 30m length. 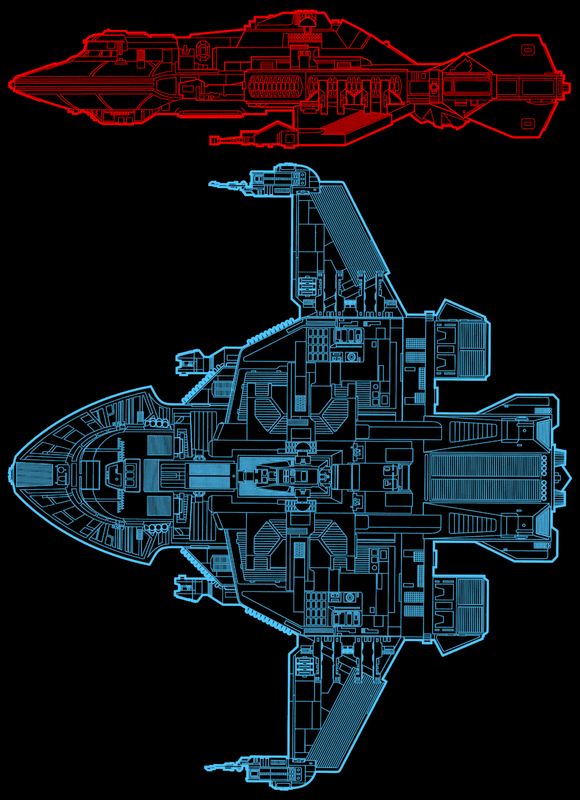 This complies with the size of the preliminary raider built for TNG: "Preemptive Strike" where there was a cockpit window instead of the bridge. If on Voyager, in a later season, "almost a quarter of the crew is Maquis", the minimum number of original crew members on Chakotay's ship would be 37, assuming that no one died during the transition to the Delta Quadrant. Three decks may be distinguished, but there are no windows or other details to confirm this. For a crew of 37, an overall length of 60m (for 3 decks with a height of 3m each) appears to be the minimum possible value, but only if there are no real quarters. A half-way reasonable explanation for the big crew, considering that the small size of the ship is well established, is that the normal crew complement is significantly lower, at most around a dozen. 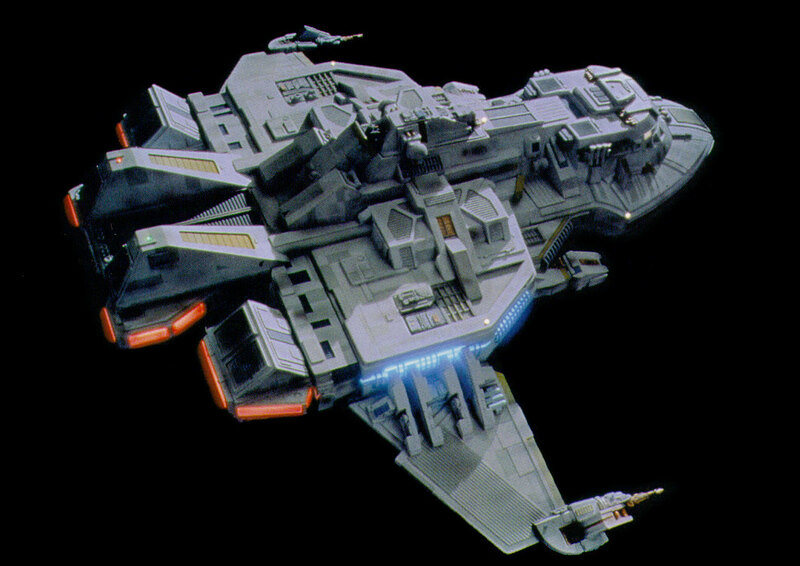 The raider may have been manned with 37 or more Maquis because they were going to hijack a Cardassian ship, possibly a freighter, when the Galor-class cruiser foiled their plan and the Maquis had to seek refuge in the Badlands. 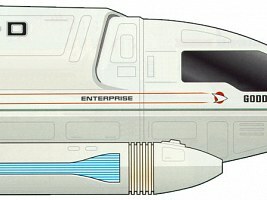 Voyager is the first ship to have foldable nacelles and pylons, at least the first ship we know of. "Because Voyager employs a new folding wing-and-nacelle configuration, warp fields may no longer have a negative impact on habitable worlds, as established in TNG." This sentence from the Star Trek Voyager Technical Guide V1.0 is actually the only hint that the folding pylons may prevent the subspace damage of TNG: "Force of Nature". It was never mentioned on screen. Another theory is that the efficiency of the warp field can be increased if it is continually tilted as the speed rises, in a similar fashion as on the F-111 and other aircraft with variable wing positions. However, the existing shots of Voyager in space don't make any sense, since only two angles of the nacelle pylons can be observed: 0° (horizontal) for impulse flight, and about 35° as soon as the ship goes to warp, remaining constant irrespective of the speed. While it makes sense for an aircraft to have just two wing positions for slow and for fast hypersonic flight, Voyager's warp drive is offline at impulse anyway, hence not requiring any specific nacelle position. 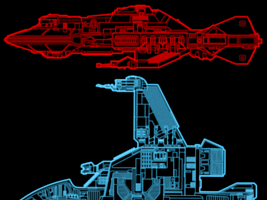 It is not evident why the nacelles are folded up at all every time the ship goes to warp, and why they are not just fixed in the warp position. Voyager's MSD clearly shows two warp cores (more precisely, two complete matter/antimatter reaction assemblies), one just behind the deflector dish, and one close to the kink of the hull undercut. Obviously one of them, the one we see in main engineering, is active all the time, while the other one must be a backup. Actually, the aft core is the main core, as we could clearly see in VOY: "Day of Honor" where it had to be ejected. 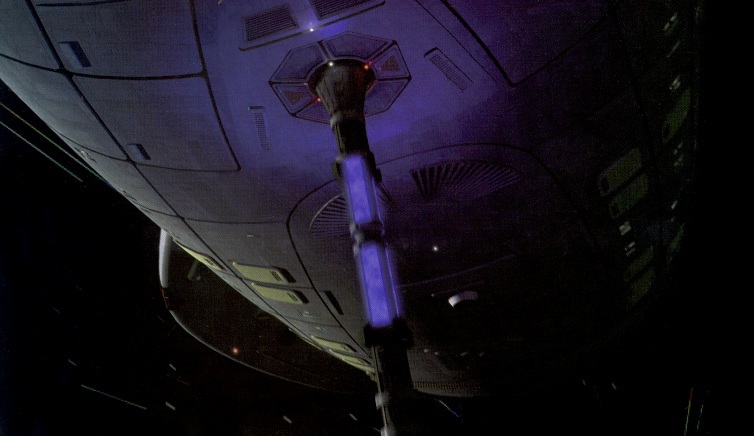 The problem is that it was made a big deal in this episode (and again in "Renaissance Man") that this seemingly only warp core was essential and that the ship could not go to warp without it. But why didn't they just use the second warp core? After all, that is exactly what it was intended for. It is obvious that the second core may not be activated where it is stored but needs to be transferred to main engineering and connected again. But why would this be so much harder to accomplish with the backup core than with the main core that, in both episodes, Janeway doesn't even try it but rather sends shuttles against heavily armed ships to retrieve it? Rick Sternbach, the ship's designer, once suggested that the second core was not supposed to act as a backup on stand-by, but that it would merely serve as a set of spare parts. Anyway, why would the ship carry only partial builds where it could have a complete core, and where the MSD shows something that looks like a complete core? It even makes less sense if we consider that usually Voyager would have been under way in the Alpha Quadrant. If the installation of the backup core were really that difficult and time-consuming, a repair ship or tug may have arrived to assist much sooner, so why have a spare core at all? Maybe the second core was irreparably damaged and even abandoned some time before "Day of Honor". Another possible explanation is that parts from the spare core that could not be replicated were already in use in the main core. Or, although this would be a stretch, perhaps the second warp core is designed to supply just the holodecks (see Holodeck vs. replicator energy above)? 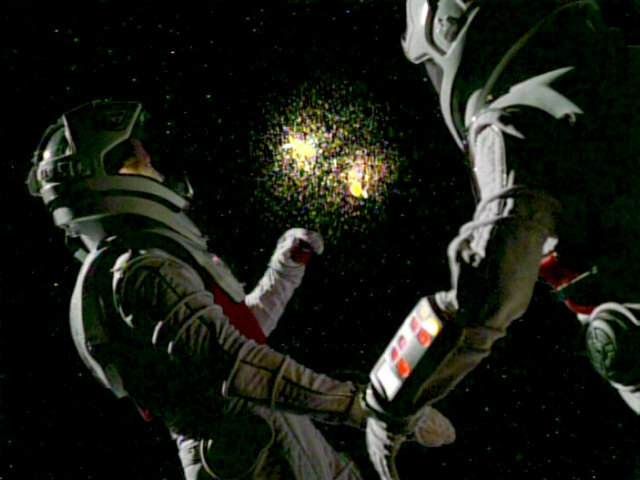 In VOY: "Dark Frontier" the crew trains to raid an active Borg cube to steal a transwarp coil, an extremely dangerous mission for a chance to get home much sooner. However, in "Unity" and "Collective" the crew has access to functional yet unoccupied cubes and yet don't bother to take a transwarp coil from either? In both episodes, although damaged, the cubes are still largely intact and no mention is made about the coils, functional or otherwise. We may explain the missed opportunity in "Unity", assuming that the crew may not yet have sufficient knowledge of Borg technology or of how to integrate it. At latest in "Collective", however, it is just stupid not to salvage the component. Following the flight path of Voyager, it is easy to notice that the Delta Quadrant is not directly adjacent to the beloved Alpha Quadrant, but that there is still the Beta Quadrant in between. After a journey of more than six years and some fast leaps (like 10,000ly with slipstream in "Timeless" and 20,000ly with the transwarp coil in "Dark Frontier"), Voyager should have crossed the border to the Beta Quadrant at latest by the sixth season - which is easy to reckon if we just subtract all the long and short leaps from the initial distance of 75,000ly. Nevertheless, the authors still kept the ship in the Delta Quadrant. The real-world reason was as obvious as it is silly: TPTB thought they would confuse occasional viewers with too much galactic geography. Anyway, for a certain time it was still credible that Voyager was still in the Delta Quadrant, considering that some detours were necessary to avoid the Borg or large anomalies. Still, it is absolutely unacceptable that the Beta Quadrant was mentioned only three times(!) in seven years, and only once as being on the route to the Alpha Quadrant. This is even worse considering that the Beta Quadrant as the home of Klingons and Romulans and a part of the Federation ought to play an important role. Even in VOY: "Message in a Bottle", where the Prometheus was hijacked by Romulans and was about to enter their territory, the dialogues all said "Alpha Quadrant" instead of "Beta Quadrant". The quadrant wasn't treated much better in DS9 either, for the galactic powers only struggled for the control of the "Alpha Quadrant" - have the Klingons and Romulans forgotten where they come from? I wonder why the wonderful concept of four quadrants was first systematically introduced, only to be effectively discarded later. 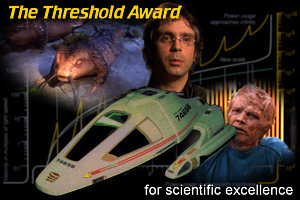 I think hardly anyone would contradict my perception that no other episode ever featured so much scientific rubbish as VOY: "Threshold", encompassing a broad range from logic and mathematics over physics and biology to engineering. It's the episode where the crew develops a transwarp drive, Tom goes to Warp 10, evolves to a new lifeform, kidnaps Janeway and has children with her. Bizarre enough. I don't know if it's rather fun or masochism to list the countless errors and fallacies of this episode, but here we go. The episode begins with Tom, B'Elanna and Harry simulating the Warp 10 flight. How is this possible? You can't simulate something that you deem impossible, and for which you have no equations and models that could describe a physical reality. Millions of engineers in the Federation have been working in vain on the development of transwarp technology for at least a century. Yet, a small team of three, on a starship with limited resources that has gone astray in the Delta Quadrant and is frequently attacked, succeeds in doing exactly this in their spare time. They work out a theory, design and build a prototype in a matter of one month. Yes, and I am sure in the 21st century the first nuclear fusion reactor will be built by the crew of a submarine while on an extended underwater mission. Well, Tom mentions something that serves to justify why the transwarp drive is being built right here and now: "We discovered a new form of dilithium in the asteroid field we surveyed last month. It remains stable at a much higher warp frequency." However, it is nothing more than a myth (unfortunately a recurring one on Voyager) that it only needs enough power to achieve previously impossible speeds with the same basic hardware, like you could break the sound barrier with a VW Beetle if only you had the right fuel. All official publications and even the episode itself unmistakably state that Warp 10 equals infinite speed and that, in one interpretation, "it means that you would occupy every point in the universe simultaneously". Any infinite figure is merely hypothetical and may be dealt with in a mathematical equation, but never as a measurable physical quantity. Infinite speed is definitely impossible to achieve - even for Q. The dialogues in "Threshold" confirm it's impossible, still Tom achieves the impossible. One could object that Tom does not go to infinite speed, but just beyond the measuring limit. Yet, Tom states he has reached Warp 10, which we can expect to be backed by a measurement. Starfleet must be very accurate here, because there is a considerable (infinite!) difference between Warp 9.99999999 and Warp 10. Tom's "speedometer" may exceed its range of, let's say Warp 9.9999, but it would never say "Warp 10" or "infinite speed". It is also paradoxical how Tom, B'Elanna and Harry first explain to Neelix that Warp 10 is impossible, only to say they try it nonetheless, only to announce that Tom actually did reach Warp 10, only to wonder why he is gone from the sensors. This all doesn't fit together at all. If we nevertheless examine what would be necessary to reach Warp 10 in finite time, the acceleration would have to be infinite as well (with warp drive just as with any real technology). Infinite acceleration requires an infinite engine power output and, moreover, an infinitely strong IDF to keep the shuttle and passengers in one piece. The "barrier" or "threshold" is mentioned in the episode title as well as in several dialogues. If Warp 10 means infinite speed, there is no such thing as a barrier or threshold to be broken. What could be more than infinite? A possible explanation: Since infinite speed is supposed to be achieved in finite time, there could be some kind of barrier indeed - namely the barrier where transwarp instead of normal warp becomes active. Beyond this barrier the acceleration could be much higher, yet not infinite. Anyway, from the dialogues we get the impression that the barrier is supposed to be exactly at Warp 10, and that "transwarp" in this case does not refer to the propulsion system but equals the velocity of Warp 10. It is a nice thought experiment but a useless assumption put forward in reference works that a vessel moving at infinite speed would occupy all points in the universe simultaneously. Actually, it would just occupy all points along its trajectory at the time of reaching infinite speed, which has to be a straight line, for an infinitely short time. The trouble is that a straight line may get the shuttle back from where it started but probably not across the universe in all directions. The author, Michael DeLuca, or the script writer, Brannon Braga, obviously thought that the pilot of the Warp 10 shuttle would be able to travel to any desired point or return exactly to his starting point. But if the speed is actually infinite or at least high enough to overload the navigational sensors (dramatic blue shift), Tom can reach a certain region of space only by pure chance - a chance that is virtually zero. Tom, however, returns to a region of spece close to Voyager even twice after a Warp 10 flight. And aside from that, if he's everywhere at once, isn't that absolutely equivalent to being nowhere at all? Why is Tom temporarily not able to breathe normal air during his metamorphosis, but only the strange poisonous gas? Why does he become allergic to water? This can hardly be a phase of his alleged evolution, since in nature there wouldn't be a well-equipped sickbay to support this. Agreed, we know similar procedures from TNG: "Identity Crisis", TNG: "Rascals", TNG: "Genesis" and VOY: "Faces". However, while the Doctor already had a hard time to restore Tom when he was only slightly mutated just after his Warp 10 flight, it is even more incredible that he succeeded to restore Tom and Janeway after virtually nothing of their DNA is left. In order to restore Paris, the Doctor has a fabulous idea - how about feeding antiprotons from the warp nacelles into his damaged cells? Antimatter has been used for all sorts of barely credible purposes in Star Trek before. But dear Doctor, please keep it off your patients, unless you want them to act as a spare warp core or a photon torpedo! Thanks to Christian for the facts about the "Beta Curse", to Andrew Jackson for the quote from "Night", to Timwi for suggesting that the second warp core feeds the holodecks, to Ter Loki for suggestions about variable warp geometry, to Stefan for annotations about the aeroshuttle, to Tim for a suggestion about the Maquis crew, to nixonshead for a remark about Doppler shift, to Dominic for a correction about evolution, to Ambassador for a quote from "Threshold", to Claudio Puviani for a note about "infinite speed" and to Waid for bringing up the transwarp coil and the lifeboat issues.